I was going to bake for ironcupcake-Chicago September Challenge, and the theme was Apples and Back to School. I wanted to go in a different direction with the apple and added bacon and maple syrup. I made a sample batch earlier in the week, so f I needed to tweak the recipe, I could when I made the final batch. Our dear friends were going to go as well as my husband, and then fate intervened. I started having medical issues, and they are keeping me from going to Chicago. I am really bummed, that's the way it is. So these cupcakes went to a birthday dinner for my friend, Joanna. 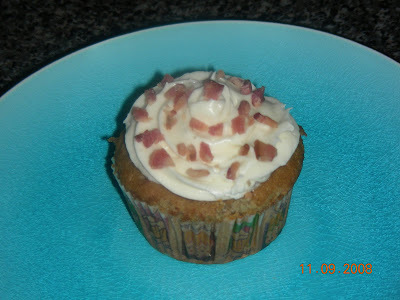 Since I didn't have to decorate the tops of the cupcakes in the Back to School theme, I just sprinkled the crumbled, cooked bacon on top. For the cupcakes I modified Garret's Vanilla Garlic recipe for Maple Bacon Cupcakes with Maple Frosting to Apple Maple Bacon Cupcakes with Maple Cream Cheese Frosting with my notes below. I added the apples, added more bacon, and used the cream cheese in the frosting to make it less sweet. The apple adds a little sweet taste and the bacon gives the cupcake a salty surprise along with maple undertones. These are a winner in my book! If you want more that 6 cupcakes, you'll have to adjust the recipe accordingly. I got nine cupcakes. 1) Cook some bacon in a fry pan (about 8 thick strips). Reserve the drippings and place in the fridge to solidify. Mince 1/3 a cup of the bacon. 2) Beat the butter and solidified bacon fat 'till light and creamy. Add the brown sugar and maple syrup and beat well until combined. 3) Add the egg and beat until incorporated. 4) Sift the flour, salt, baking soda and powder together. 5) Add some of the flour and mix, then some of the milk, then continue to alternate the dry and wet ingredients, ending with the dry. Mix until just combined. Fold in the bacon and grated apple. Taste and add more maple syrup, flour, or milk if needed for desired taste and consistency. Keep in mind the maple frosting is very sweet, and to add in very small increments for alterations as maple syrup in large amounts can break a cake batter. That's why I added the cream cheese to the frosting recipe. 6) Fill cupcake liners 2/3 full and bake at 350 F for 18-22 minutes or until a toothpick comes out clean. Be sure to rotate the pan after the first 15 minutes for even baking. Maple Syrup Cream Cheese Frosting.. Combine the syrup, cream cheese, and butter until combined. Add the sugar, a bit at a time, and whip at high speeds until combined and fluffy. Pipe or spread onto cupcakes. Sprinkle with crumbled, cooked bacon. Apple, Bacon & Maple this is a really great combo Becky! Blogging is harder than most people think at first, but you are growing so much, I can really see that! I have a simple camera too, what I find helpful, is turning the flash off, and bringing the food to a table in front of a window, get as close as possible, but still in focus or if there is no sun, outside is a great place. Just take an apple or someother item and move it all over your house till you find a spot with good lighting, good thing about digital is delete! Hope this helps, feel free to send me a message if I can be our more help to you! Gina-Thanks so much for the words of encouragement and tips for photography. Part of the problem is that my house in on a very wooded lot, and there is an overhang around the house, so we don't get direct sunlight in front of windows. I may try outside, and see how that goes, but out patio only gets little bits of sun at various times of the day. I'll keep trying. Wow, apple, bacon and maple syrup! Give us a shout at http://www.maplesyrupworld.com/, we would love to feature this recipe! I have exactly the same problems with photography as you. The pictures never look as good as I'd like and I'm so envious of the photos on other people's blogs. Searching for Spice- It's so frustrating isn't it, and I drool over other blogs pictures. Thank you for stopping by.